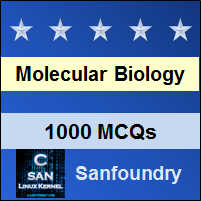 This set of Molecular Biology Multiple Choice Questions & Answers (MCQs) focuses on “The Genetic Code – 1”. 1. Which of the following is not a feature of the genetic code? Explanation: The genetic code is non – ambiguous. This means that there is no ambiguity about a particular codon. A particular code will always code for the same amino acid wherever it is found. Explanation: The codon is a triplet. Singlet and doublet codes are not enough to code for 20 amino acids. Again in case of a quadruplet codon there will be 256 possible codons which are highly excessive. Triplet codon thus is the minimum requisite having 64 possible codons. 3. There is one amino acid for one genetic code. Explanation: In a triplet code for a particular amino acid more than one word can be used. This phenomenon is described by saying that the code is degenerate. A non – degenerate could be one where there is one to one relationship between amino acids and the codons so that 44 codons out of 64 will be useless or nonsense codons. 4. One base in an mRNA can be used for more than one codon. Explanation: One base in an mRNA cannot be used for more than one codon. This is because the codes are non – overlapping. 5. Which of the following is not a termination codon? Explanation: UGA, AGA and AGG are termination codons of which UGA is the universal termination codon and AGA and AGG are mitochondrial termination codons. But UAC is the universal codon for tyrosine. 6. In case of mitochondrial genetic code UGA is a ____________ codon. Explanation: In case of mitochondrial genetic code UGA is a tryptophan codon. But UGA is a stop codon in the universal genetic code. Explanation: In 1966, Francis Crick devised the wobble hypothesis to explain the observations regarding base pairing. It states that the base at the 5’ end of the anticodon is not as spatially confined as the other two, allowing it to form hydrogen bonds with any of the several bases located at the 3’ end of a codon. 8. The distribution of codon is made in such a way to minimize mutation effect. Explanation: Inspection of the distribution of codons in the genetic code suggests that the code evolved in such a way as to minimize the deleterious effects of mutations. For instance, mutations in the first position of a codon will often give a similar, if not same, amino acid. 9. Point mutation of the second place mutating “A” with “T” will result in a similar if not same amino acid. Explanation: Codons with pyrimidines in the second position specify mostly hydrophobic amino acids, whereas those with purines in the second position correspond mostly to the polar amino acids. Thus when purine “A” is replaced by pyrimidine “T” it results in an amino acid swap between hydrophobic to polar amino acids. 10. Which of the following genetic code shows ambiguity? Explanation: UGA is one of the universal termination codon. But UGA codes for tryptophan in mitochondrial genetic code.